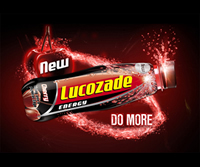 Lucozade Energy is a popular drink from pharmaceutical group GlaxoSmithKline. The drink has a large market in the UK, Australia, and New Zealand. The drink was first created in 1927, but now is branded simply as an energy drink. All flavors of Lucozade Energy Have the same caffeine content. 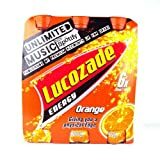 GlaxoSmithKline also make a "sports" version of the drink called Lucozade Sport - this is a completely different drink to Lucozade Energy. 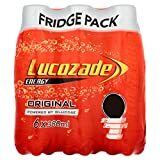 This was a drink that really surprised me, Lucozade has been a part of my life for as long as I can remember and it only really ever came it two flavors. The infamous original flavor that tasted like nothing original at all and of course the Orange flavor that I spent most of childhood downing. This drink, however, unlike the other two had a very definitive taste and aroma. So I cracked open a Lucozade Cherry and gave it a good sniff. As with wine, if energy drinks smell fowl then they normally taste the same. When I did this I got a strong waft of cherry and it reminded me instantly of Cherry Drops and cherry cough sweets. Although a little bit overpowering at first, I took a good long gulp and was pleasantly surprised. It tasted like it smelled. It was like drinking cherry jam which is a really nice feeling to be honest. The taste itself was really rather sweet and if you lack the sweet tooth this isn’t a drink for you. After finishing the first one, I went straight onto the next and downed that pretty quickly as well and I have to say by this point the taste was getting a little overbearing. I don’t think it’s a drink that can be had in to large a quantity. As with any quick succession of drinks the ensuing belching tasted like cherry ice cream which was pleasant, I guess, but really got on my nerves as it started to make me feel some what queasy. Now I’m not saying this is the effect that everyone will get, but I drank Lucozade Cherry like I do after a rugby match which is to just down a couple and I’m good to go. I have to say this had a different effect on me. It was a lot harder to stomach the sweetness in comparison to the other flavors as an after sport drink. Lucozade Cherry doesn't have much to brag about in this category, basically glucose, vitamin c and 46mg of caffeine per 380ml bottle. Well apart from the sickly feeling mentioned above (due to my own fault), it gave the same boost as the good old Lucozade Energy did. There’s nothing different or special in this one ingredient wise. 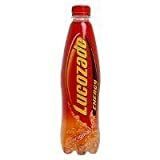 The steady flow of sugar into my system brought me back up to par after going for a run as have all other Lucozade’s in the past. I’m not a massive fan of cherries, but I felt it was my duty to try this drink out and I have to say I really liked it. I think in my mind it serves a different purpose to the other Lucozades. This one isn’t a drink you down at the end of a game, it’s something you drink over a long period of time and savor the sweet taste. Although Lucozade Cherry's not a drink for me in its own right, I reckon it’s something a lot of people will like and something people should defiantly try. Carbonated Water, Glucose Syrup (26%), Citric Acid, Lactic Acid, Flavourings (including Caffeine), Preservatives (Sodium Benzonate, Sodium Bisulphate), Antioxidant (Ascorbic Acid), Colour (Sunset Yellow). Lucozade contains 3.58 mgs of caffeine per fluid ounce (12.10mg/100 ml).